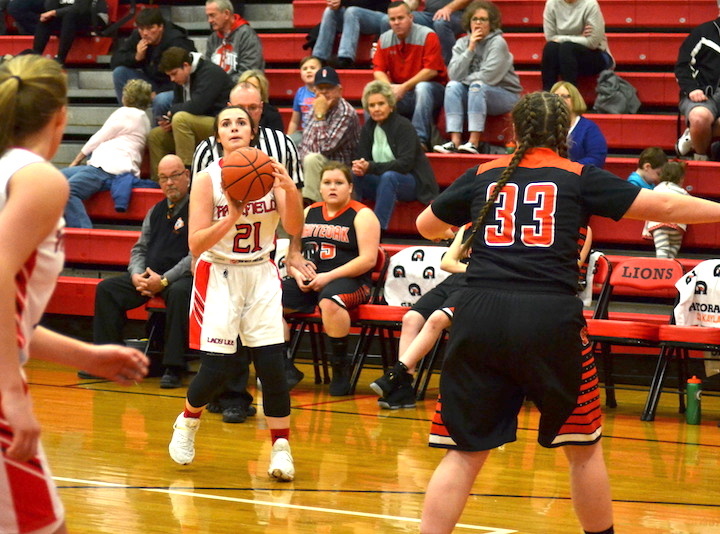 For the ninth time this season, the Fairfield Lady Lions have earned a win, and on Thursday night they gained a Southern Hills Athletic Conference victory by defeating the Peebles Lady Indians, 62-53. The road win for Fairfield saw a trio of Lady Lion players score in double figures, including Brianna Barnes with 16 points, Molly Thackston with 15 points and Samara Cannon with 11 points. Barnes totaled seven two-point buckets and was 2-of-4 from the free-throw line. Thackston in her season-high-scoring game finished with five two-point baskets, one 3-pointer and she was 2-of-7 in free-throw shooting. Cannon totaled four two-point field goals and with that was 3-of-4 from the free-throw line. In the first frame, the Lady Lions outscored the Lady Indians 19-12. Barnes made four two-point baskets in the opening frame, while Thackston sank a 3-pointer and made a two-point bucket. Also in the first, Trinity Huff made two baskets, and Lauren Arnold also made a basket in the opening frame. The Lady Lions won the second frame at 17-10 with Cannon scoring seven points in the quarter, while Barnes tallied four points in the same quarter. Also in the second, Ella Newkirk, Arnold and Thackston each scored two points. FHS led 36-22 at halftime, and once the third frame was complete, they led by a 47-37 score with FHS scoring 11 points and the Lady Indians tallying 15 points in the third. In that third frame, FHS had 3-pointers by Emma Fouch and Arnold, while Thackston scored three points in the frame and there were also two points from Barnes. The fourth and final frame had 15 points from FHS scored by Cannon with four, Fouch (two), Huff (two), Thackston (five) and two from Barnes. For the game, other final scoring totals by the Lady Lions included Arnold (seven), Huff (six), Fouch (five) and Newkirk (two). Fairfield finished with 21 two-point baskets, three 3-pointers and were 11-of-19 from the free-throw line. Peebles was led in scoring by Tatum Arey with 18 points, making nine two-point baskets. Also in double figures was Jacey Justice with 17 points, totaling five two-point baskets, one 3-pointer and she was 4-of-4 from the free-throw line. Also for PHS, Hope Brown totaled four points, while Harlee Wilkerson and Lilly Gray each finished with two points. The Lady Indians finished with 20 two-point baskets, three 3-pointers and were 4-of-7 in their free throw shooting. Fairfield improves to 9-12 overall and 5-7 in the SHAC, as they are tied for third place in the SHAC Division II standings. Peebles is now 14-8 overall and in first place in the SHAC Division II standings at 8-5, a half-game ahead of Manchester, who have one SHAC game left on the schedule.